+SPD: This boon can be taken to elevate his base Speed stat of 32 to a respectable value of 35 and strengthen his ability to perform follow-up attacks; though most builds can get mileage out of this IV, a Speed boon is most effective when utilized in builds using the Firesweep Bow. +ATK: Also a great choice for his IVs, an Attack boon can be taken to help increase his raw damage output and pairs exceptionally well with builds revolving around the use of Brave Bow or Jeorge’s personal weapon, Parthia. HP: Although not particularly high by any means, Jeorge’s HP is generally enough to let him take a single hit in retaliation from physical and magical damage dealing foes alike, making it best to leave it at neutral. -DEF / RES: Both of Jeorge’s defensive stats are quite poor but thanks to his decent HP pool, either one can be lowered without affecting his overall performance too much. A Player Phase oriented build that revolves around the use of the Firesweep Bow, a powerful weapon that allows Jeorge to focus entirely on boosting his offensive potential without the worry about being killed in retaliation thanks to its effect of canceling out all enemy counterattacks. Similarly to other Firesweep users, Jeorge will be entirely dependent on his ability to perform follow-up attacks for his damage output, thus making a Speed boon his best choice of IVs to complement this build’s playstyle. Jeorge has two options for his Special -- Moonbow and Luna -- with the choice between the two ultimately depending on the seal he is using. When utilized in tandem with the Flashing Blade seal, Moonbow will be able to activate in any combat where Jeorge is able to double his opponent. If the Flashing Blade seal is unavailable, then Luna will be preferred over Moonbow as both options will activate in every other encounter if assuming that he doubles in each combat. Atk/Spd Solo provides Jeorge with a substantial +6/+6 boost to his offenses at no cost to his defenses, only requiring him to have no adjacent allies in order to activate its effect. Furthermore, as Jeorge will commonly be out in the frontline and away from his allies, Atk/Spd Solo's positioning requirement will generally be easy to satisfy, making it an exceptional choice of A slot overall. If it is unavailable, Life and Death can be taken and grants Jeorge with a substantial +5/+5 Atk/Spd boost, although this does come at a steep cut to his defenses -- however, thanks to the Firesweep Bow’s effect, Jeorge should rarely, if ever, be taking damage, rendering the cut to his defenses a non-issue. Should one wish to preserve his bulk in the case that he will need to take a hit in the Enemy Phase, Swift Sparrow is also a suitable A slot though it does come at the cost of providing a slightly weaker boost to his offenses. As running the Firesweep Bow allows Jeorge to forego the need to utilize Desperation altogether, his B slot is open to several other options, most notable of which being Chill Spd. Chill Spd inflicts a significant -7 Speed debuff to the fastest unit on the opposing team, allowing Jeorge to effectively shut down otherwise pesky speedsters. On a budget, Swordbreaker can be used to ensure his follow-up attack against even the speediest of sword units, such as Karla, Mia, Soleil, and Ayra. For his C slot, Even Spd Wave and Odd Atk Wave are both exceptionally potent options to boost his offensive potential as well as make him more self-sufficient. Jeorge is not dependent on these skills to function properly, however, and either be replicated with team support, leaving his C slot open to any skill such as his native Spur Spd. Aside from the Flashing Blade seal, the Attack +3 and Speed +3 seals can be used instead to enhance one of his offensive stats further. Parthia’s weapon refine has breathed new life into the initially unimpressive weapon and allows Jeorge to act as a rather strong counter to all ranged units alike; on top of gaining a 30% damage reduction from incoming magical attacks, Parthia’s refined effect provides Jeorge with an impressive +6 in-combat boost to his Attack when fighting against other ranged opponents. Rather than relying on his bulk, Jeorge is dependent on his ability to consistently OHKO his opponent to stay alive, allowing him to take on a distinctly different playstyle from other anti-ranged units. Accordingly, an Attack boon is ideal to heighten his OHKO potential further. Glimmer is a strong choice of Special to utilize with this set as it scales well with the heavy focus on stacking Jeorge’s Attack stat and thanks to its low cooldown, Jeorge will be able to activate it frequently. Sharing the same benefit of having a rather low cooldown, Moonbow can be considered to solidify his matchups against particularly bulky ranged foes such as Winter Tharja. Draconic Aura is also an option available to him should one value consistent damage increase over faster Special activations. Atk/Spd Solo is an excellent choice for his A slot and helps strengthen his Enemy Phase prowess tremendously; when paired with Vantage, Jeorge will be able to serve as an exceedingly strong check to all ranged foes alike and hit them with the full brunt of his power before they can even land their first attack, in addition to gaining more overall survivability by denying his opponent's follow-up attack. Alternatively, one can take Fierce Stance should Atk/Spd Solo to similarly augment his offensive potential, though Fury is a good choice as well to grant him more overall versatility as a unit, trading in some of Fierce Stance's firepower in exchange for coverage in both phases. For his C slot, Odd Atk Wave is a good option to offer him a significant boost to his OHKO potential as well as allow him to potentially provide team support on odd-numbered turns. However, as it is not entirely a necessity for him, any C slot skill that best fits his team composition can be used, such as his native Spur Spd. The Fierce Stance seal is a fantastic choice to offer him a substantial boost to his offensive potential in the Enemy Phase, though the Quickened Pulse is an equally effective option when utilized with Glimmer or Moonbow to ensure his Special activation on his first counterattack. Although incredibly niche in actual usage, the Deflect Magic seal can also be considered to allow Jeorge to bait and survive Reinhardt. Although Brave weapons have fallen out of favor as the game has progressed, Jeorge can still run a Brave Bow set to great effect thanks to his decent offenses. However, as his Speed is too low for him to reliably quad, it is best to focus on maximizing his damage output with just his first two strikes. As such, it is recommended to utilize an Attack boon as well as the Attack +3 seal alongside Attack buffs to enhance his ORKO potential. 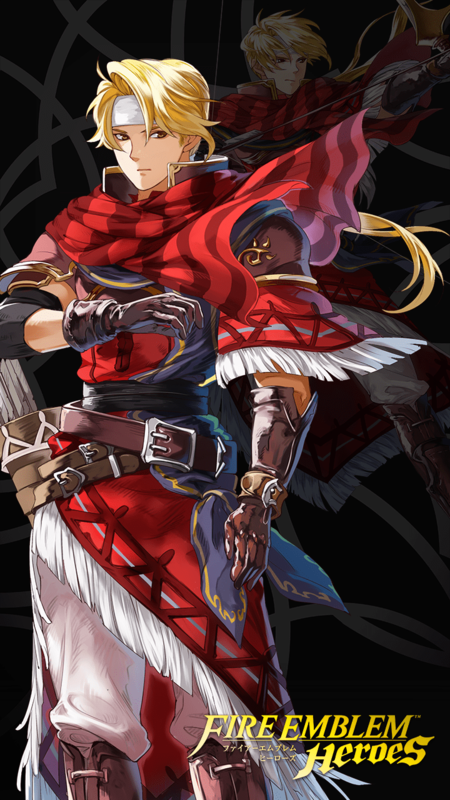 Due to the nature of Brave weapons, any boost to his Attack is extremely beneficial to him as even just running an Attack boon and the Attack +3 seal grants Jeorge an additional +12 damage. For his Special, Luna will generally be Jeorge’s best option as its Defense reduction is useful when facing against bulky opponents whom he would otherwise have difficulty in dealing with. Alternatively, one can use Moonbow in tandem with the Quickened Pulse seal to ensure its activation in Jeorge’s first round of combat. Otherwise, they will both activate in every other round of combat, making Luna the better option. Death Blow 4 is his ideal choice for his A slot as it offers him a massive +16 damage when taking the Brave Bow’s effect into consideration. However, should it be unavailable, Death Blow 3 works perfectly fine on a budget. To help complement this build’s playstyle further, Chill Def can be taken as his chosen B slot skill, increasing Jeorge’s damage output significantly by lowering the Defense stat of the opponent with the highest Defense by 7 points, however, keep in mind that Chill Def can be inconsistent in that it targets the opponent with the highest Defense stat and not necessarily the one with the greatest physical bulk. One also has the option of running a Breaker skill such as Swordbreaker to shut down a specific weapon type the rest of his team faces trouble in dealing with. Jeorge has no attachment to any particular C slot and is flexible, though Odd Atk Wave is always a good option to bolster his offensive potential on odd-numbered turns. A sniper of great renown, Jeorge, Perfect Shot, is an offensively oriented infantry archer from Fire Emblem: Mystery of the Emblem. He wields the legendary bow, Parthia, an originally underwhelming weapon that now allows him to distinguish himself as an offensive anti-ranged unit; in contrast to other anti-ranged units who rely on their bulk to deal with such foes, Jeorge relies on sheer power alone to defeat his opponent. Statwise, Jeorge boasts a considerable neutral offensive spread of 32/32, allowing him to be a good user of the common, but powerful, Firesweep and Brave Bows as well as his native weapon, Parthia. His defenses, however, leave much to be desired but thanks to his decent HP pool, Jeorge generally has just enough bulk to take a single hit from an enemy, both physical and magical alike. Unfortunately for the Archaean archer, this also means that he will crumble fast to sustained offensive pressure. Additionally, though not particularly bad, his offensive potential falls a little flat in comparison to some of the other hard-hitting archers who easily outclass and overshadow him as a result of their superior offensive statlines and other dominating qualities. All in all, Jeorge is a solid infantry archer boasting surprising versatility and decent offenses as well, making him an overall great investment for those looking for a dependable unit capable of carrying their own weight on any given team. Jeorge’s neutral offensive spread of 32/32, while not particularly outstanding, is respectable and lets him inherently possess a solid offensive presence, which can be enhanced further by providing him with the proper IVs, build, and support. Initially an unimpressive personal weapon, Parthia’s new refine allows Jeorge to differentiate himself from the rest of his competition as an offensive anti-ranged unit. Due to his access to both Parthia and the commonly used Firesweep and Brave Bows, Jeorge’s role in any given team is fairly interchangeable depending on what is needed of him. His relatively balanced stat spread also complements his versatility. Though not tanky by any means, Jeorge’s decent physical and magical bulk of 61 and 59 respectively allow him to generally tank a single hit from an opposing foe. Despite having decent overall bulk, Jeorge’s actual defensive stats are quite poor and leave him liable to dying outright to sustained offensive pressure. Jeorge faces extremely stiff competition from a plethora of other similar offensively oriented archers who, thanks to their superior offensive statlines, can contest and exceed his damage output, ultimately outclassing him. Refined Parthia does, however, alleviate this issue for Jeorge as it allows him to stand out as a strong anti-ranged unit. Refreshers: Regardless of the build he is utilizing, Jeorge benefits considerably from receiving refresher support -- offensively oriented sets appreciate the added versatility in mobility while Parthia sets can take advantage of the extra turn to move to more favorable positions. As such, refreshers like Hoshidan Summer Micaiah, Ninian, and Performing Olivia make for excellent teammates. Tanks: As Jeorge will fall quickly to sustained offensive pressure, tanks such as Sheena, Gwendolyn, and Winter Lissa can be used alongside him to take on hits for him and leave him out of harm’s way. Buffers: Buffers such as Marth, Corrin (M), and Ephraim can also be good choices for allies as they can improve Jeorge’s performance substantially, allowing him to act more on par with the likes of stronger offensive archers such as Bridal Cordelia. Debuffers: In a similar vein, debuffers such as Sothe, Brave Veronica, and Arvis also improve his performance by debilitating opposing units, making them much easier to deal with. The former two have the added benefit of also being able to provide Jeorge with buffs simultaneously. Armors: Thanks to their strong defensive capabilities as well as their access to class-exclusive buffs, armored units such as Hector (LA), Brave Ephraim, Arden, Brave Hector, and Fallen Robin (M) can quite easily take Jeorge’s attacks head-on and use them to their advantage to charge their Specials faster. Hyper Offense: As a result of his low defensive stats, Jeorge, like many other similar units, faces difficulty when confronted with sustained offensive pressure, often dying outright. Examples of units who can apply such pressure include Brave Celica, Cherche, Alm, Halloween Jakob, and Effie. Raven Tomes: Though they have recently died out in popularity, users of the Raven tome + Triangle Adept combination like Robin (M), Robin (F), Cecilia, Lyon, and Sophia can still prove to be effective counters to colorless units such as Jeorge. Jeorge is the number one best sniper strategist to invest into, especially for Aether Raids. He hits really hard for an archer thanks to his Parthia refinement so you definitely wanna give him both Death Blow and Fierce Stance so he can hit even harder while having Poison Strike and Savage Blow to help deal more damage. He can very useful in dealing with ranged fliers like Aversa, Legendary Azura, or Kinshi Hinoka who are common in Aether Raids. But remember, while his Parthia refinement can reduce the magical damage he can't tank through the magic forever. Please note that his stats are influenced by S Summoner Support and a current +4 merge. I chose this build so Jeorge can be a mixed tank of a unit. He always hits hard and with 36 speed, he can double/deny doubles on enemies. At 75% health, Jeorge is terrifying to attack as both Brazen and Vantage activate, demolishing any ranged unit. He also has Distant Def 3, adding even more defense/resistance to 33/31 without the aid of Brazen. I got this Jeorge a month after game's release and have been upgrading him slowly as the game gets older. I recently refined Parthia and Jeorge is starting to become my favorite unit in the game. For IV I find plus speed boon is the best as it can help avoid a large amount of double which Jeorge can only survive one (however Atk works almost as good). For banes -Hp or -Def works however my experience with -Def (with my main Jeorge being +Spd, -Def) makes me lean on -Hp being better. I don't recommend -Res as even though there is a 30% damage decrease from magic, bladetome and raventomes will still be a big threat. -Res could work if you use him for grand conquest and only need a counter for a majority of mages and bows however he will probably be oneshotted by a TA raven or a buffed Bladetome. Brazen (always go for one with Atk) role is obvious, you want to PP or EP a ranged enemy and then obliterate any range enemy or watch them blow up themselves with Vantage then kill any DC user with Luna and your new 7 defense. I used to use Distant Defense as my Sacred Seal but in higher levels of arena and conquest maps, Speed +3 is just alot more of a better option as it works on both phases as sometimes denies alot more damage than DD can do. ParthiaEffective against flying units. Grants Res+4 during combat if initiating attack. Blazing FlameBefore combat this unit initiates, foes in an area near target take damage equal to 1.5 x (unit's ATK minus foe's Def or Res). Seal Atk 1After combat, foe suffers Atk-3 through its next action. Seal Atk 2After combat, foe suffers Atk-5 through its next action. Seal Atk 3After combat, foe suffers Atk-7 through its next action.